Has this site been helpful to you? Please donate to keep it alive! 1) Center of Gravity. The Hobie Hawk uses a unique way of measuring the CG. 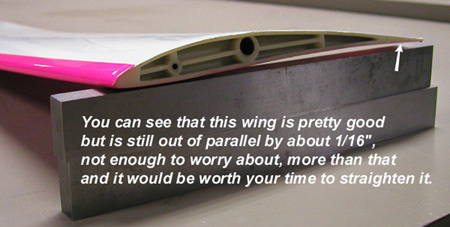 With the wings removed and EVERYTHING else (radio, Rx, battery, pushrods, rudder, elevator etc) at least taped into position, support the complete fuselage assembly by resting the main wing rod on a table edge and balance by moving the radio gear or adding weight to achieve a MINIMUM distance of 19.5" from the bottom of the tail skid to the table top where the wing rod is resting. This is the MINIMUM recommended balance point, many people I have talked with go anywhere from 20" to 20.5". Once CG is at it's desired location, secure all eqt., weights etc. This is covered on page 26 of the Hobie Hawk manual. 2) Control Surface Movement For initial setup, use the diagram below - click to enlarge. 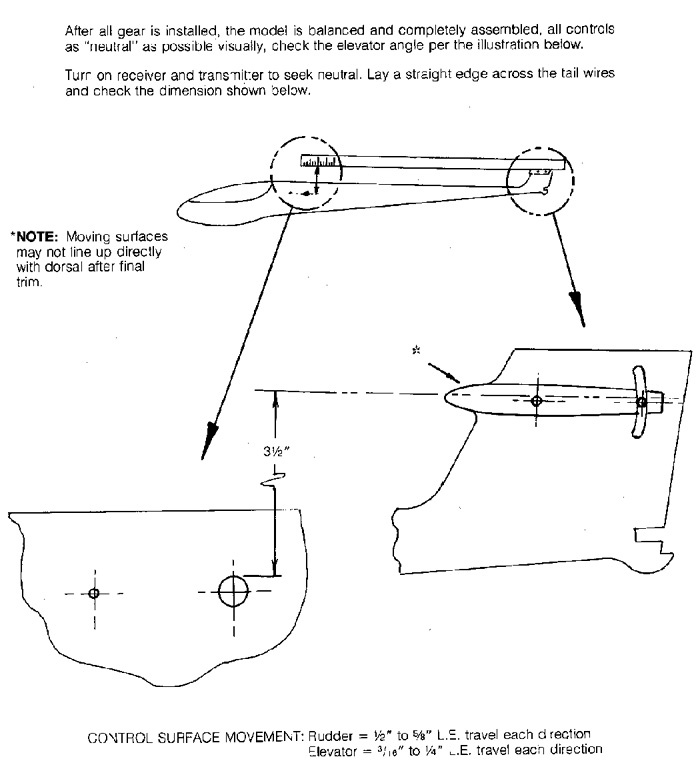 Use rudder throws per factory specification: 1/2" to 5/8" on the leading edge in each direction. DO NOT put too much throw in the rudder if you are not experianced with the Hobie Hawk. This is the problem that had many say the Hobie Hawk was "squirrely". Once you have mastered the flying characteristics of the Hawk, then go for more rudder throw. The elevator at factory spec: 3/16" to 1/4" on the leading edge each way. This is nearly max'ed, and that is where many feel is best: Max throw on the elevator. Hand toss it into a 5 to 10 mph wind to check your settings before sending it up the high start! This is covered on page 35 of the Hobie Hawk manual. 3) Wing washout and straightness This is probably one of the most important steps that frequently gets overlooked. If you want your Hawk to FLY spend the time to do this step properly!. It will make the difference between a FUN Hawk or a DIFFICULT one! This is covered on page 36 of the Hobie Hawk manual. 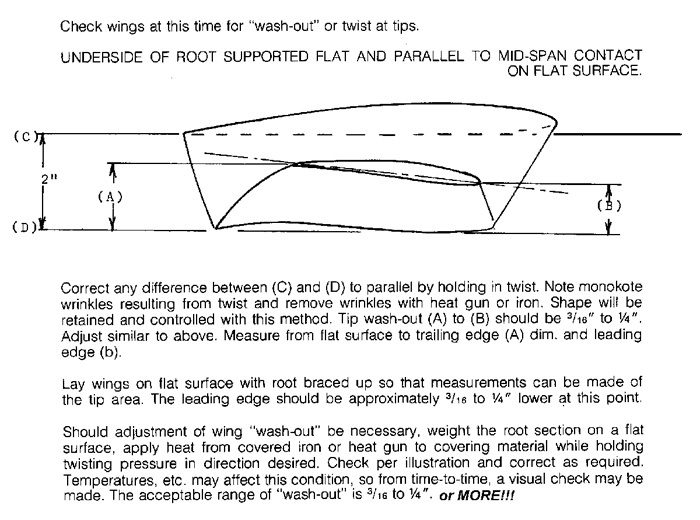 Following the proceedure in the Hobie manual: FIRST make sure that the wing is parallel down to the 14th or 15th rib. 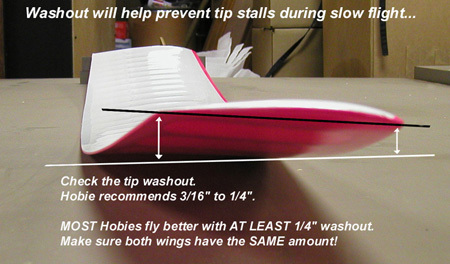 An easy way to check this is to place a 2" to 3" high block under the length of the wing root and the area of the wing that touches the table at the 14th or 15th rib must be parallel with the root. If it is not, twist the wing in the opposite direction and re-tighten the covering with a heat gun. Once the wing is parallel you can THEN proceed to check the wingtip washout. NOTE:The wing shape of the Hawk is very complex, the tuning of the wing is CRITICAL to making your Hawk an enjoyable flyer. Take the time to do this step and you will have a much better time flying!